We’re in the final stages of winter here in the Pacific Northwest, which means I’m craving greens and starting to look upon root vegetables with disdain. 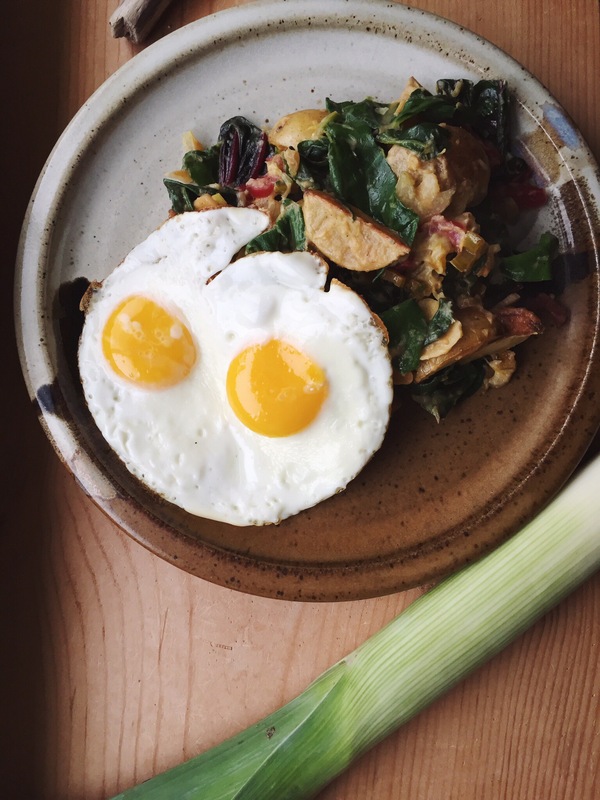 This recipe helps me bridge the gap- it’s still quite hearty with its fingerling potatoes, but the rainbow chard and leeks seem like a promise of better things to come. You’ll have leftover vinaigrette from this recipe. Luckily it’s one of my favorites and is quite versatile. I’d recommend using any leftover dressing on roasted Brussels sprouts, for dipping artichokes, or just smeared on toast. This dish would make an excellent side to roast chicken or would make a tasty brunch dish served with a couple of fried eggs. 1. Cut leek into half inch rounds. In a large skillet, heat 1 tablespoon canola oil over high heat. Add leeks and sauté until wilted and lightly caramelized. 2. Add leek, mustard, vinegar and salt to a blender and puree. Then slowly pour olive oil into the blender while running. This will create a thick, smooth dressing. Set aside. 3. Meanwhile, preheat the oven to 375°. Toss potatoes in 2 tablespoons of canola oil and sprinkle lightly with salt. Roast for 12-20 minutes, until easily pierced with a fork. Set aside. 4. In a large skillet, heat 1 tablespoon canola over medium heat. Add garlic and sauté until fragrant, about 1 minute. Add chard stems and sauté 2-3 minutes. Add chard leaves and sauté just until wilted. 5. 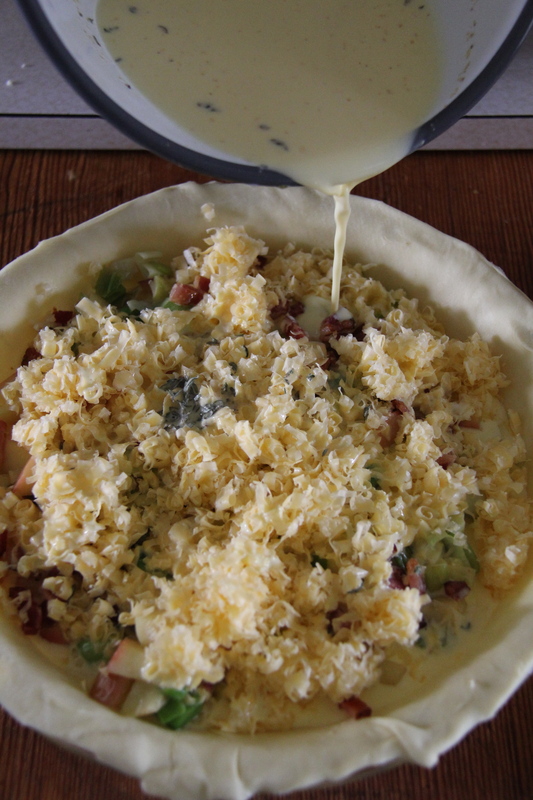 In a large mixing bowl, toss potatoes and chard with enough dressing to lightly coat everything. Season with salt and pepper. Now that we’ve entered the holiday season, it’s nice to have some simple yet impressive dishes up your sleeve for family gatherings or even those increasingly rare quiet moments at home. 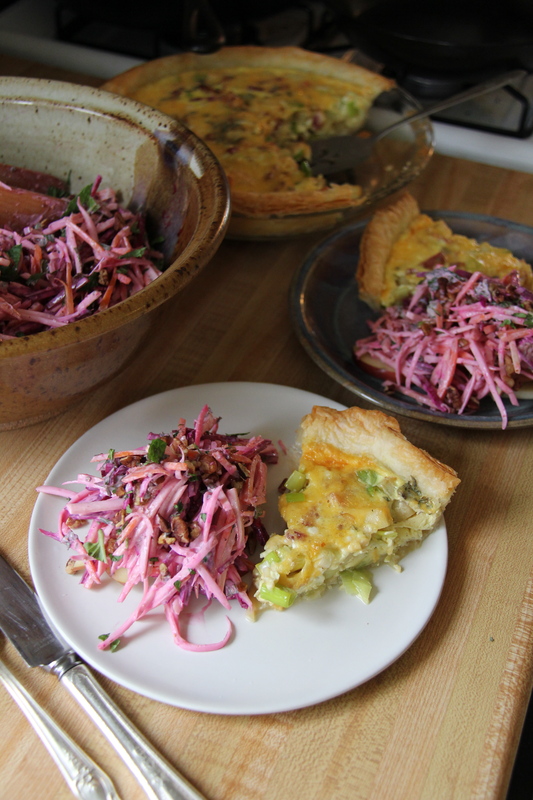 I love this dish as a simple brunch offering or as a side dish on the buffet. I opted to use puff pastry for the crust since it has such great texture and isn’t as dense as the usual pie crust. If you’re feeling super adventurous, feel free to make the puff pastry from scratch. I used Trader Joe’s brand, though it can be found at any grocery store or Whole Foods. Once again, I’ve included some options to modify this dish based on your personal tastes. I’ve made mine with sharp cheddar, though a blue cheese or Gruyere would also be delicious. If you’re making this for breakfast or brunch, a few slices of bacon that have been cooked and crumbled would make a great addition. Finally, I would recommend serving this with a light salad: just some fresh greens or arugula tossed with lemon and olive oil would be delightful! Roll puff pastry to an 11-inch square. Transfer to 9-inch pie pan and trim the edges. In a large skillet over medium heat, melt the butter. Add the leek and apples and sauté until they begin to soften, about 5 minutes. Remove from heat. In a mixing bowl, whisk together the eggs, cream, nutmeg, thyme, and salt. 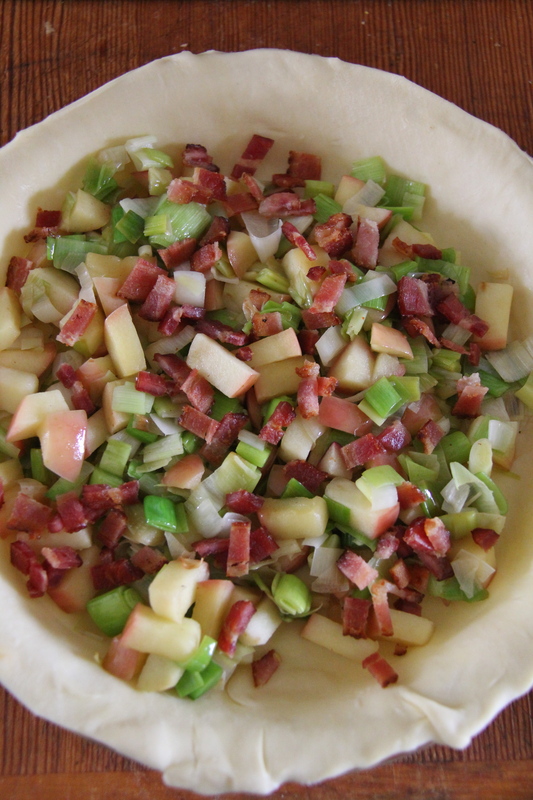 Distribute the apples, leeks, and cheese (and bacon) evenly in the pie pan. Pour the egg mixture over the top. Bake until the eggs have just set, about 25-30 minutes. 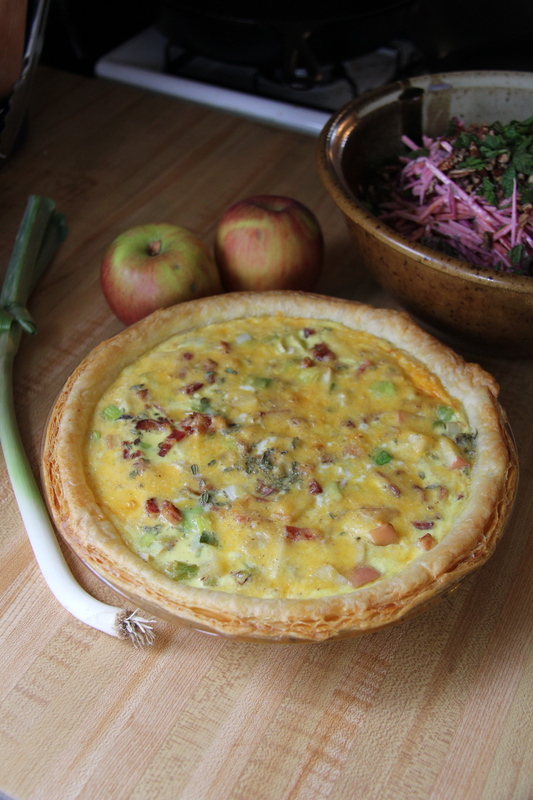 Allow the quiche to rest for about 10 minutes before cutting it. This will let the eggs finish setting up. I need to make a confession. One of my favorite foods in the world is toast. It is such a humble food, yet so filling and satisfying. Part of its beauty is that it’s the perfect vehicle for an infinite number of flavor combinations. 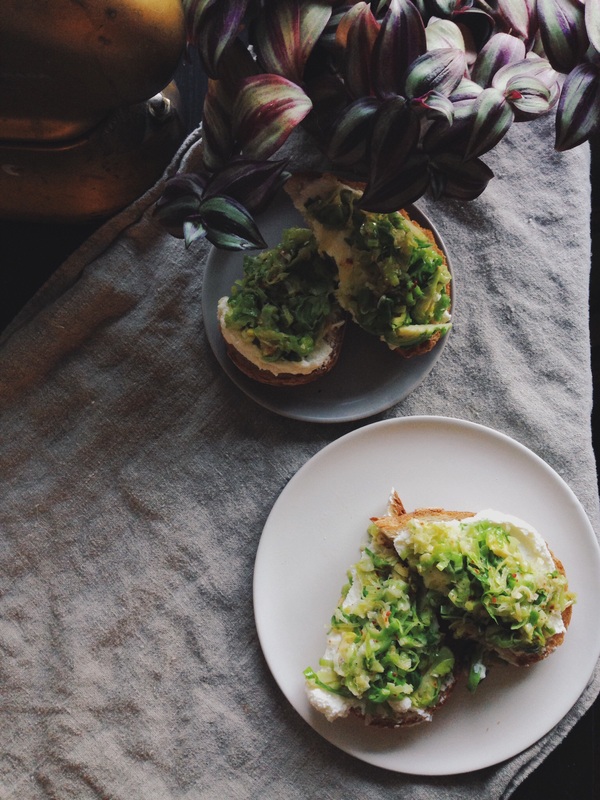 This recipe is an adaptation of one of my favorite weekday go-tos: melted leeks and ricotta on toast. Did you know that some people have a genetic predisposition to dislike the flavor of Brussels sprouts? It’s caused by a gene that makes people particularly sensitive to bitter flavors! Luckily, the method for cooking Brussels sprouts in this recipe emphasizes their inherent sweetness. If you like Brussels sprouts, then you can revel in the fact that every time you eat them, you are benefiting from their high levels of vitamins C and K. Really truly can’t stand Brussels sprouts? Leave them out! This recipe is great with just leeks and ricotta. Feeling adventurous? Top your toast with a fried egg! This recipe would make a lovely light dinner for two or you can use a baguette instead and have little appetizers for a dinner party. 1. In a large sauté pan, heat the oil or butter over medium heat, then add the leeks. Lower the heat to medium-low and sweat the leeks for about 3 minutes. 2. Add the Brussels sprouts and raise heat to medium high. Cook the mixture until the leeks are translucent and the Brussels sprouts are beginning to Carmelize. Once there, remove the veggies from the heat and stir in chili flakes. Taste and add salt to your liking. 3. Cut thick slices of bread about 1 inch thick and toast to your liking. 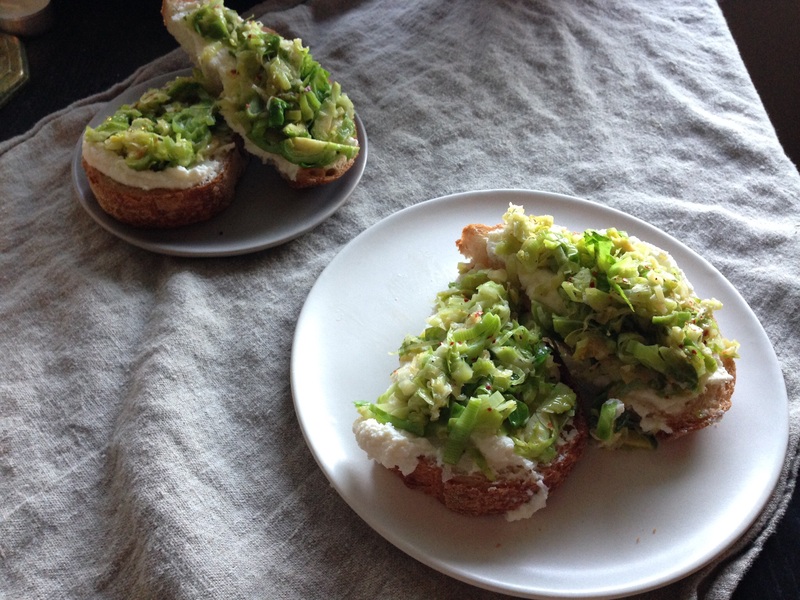 While still warm, spread a heaping spoonful of ricotta over the toast. Gently spoon the veggies over the ricotta and top with a fried egg if you’d like. Bon Appetit!